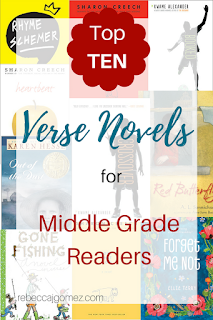 With National Poetry Month coming in another two weeks, I thought it would be a good time to write a TOP TEN list of my favorite middle grade verse novels! Verse novels are one of my favorite things to read. And to write! There's something especially special about verse novels written for middle-graders. They are so honest, often raw. They can be simple in form, yet complicated and/or tragic at their heart. Narrowing this list down to ten was challenging, as I've read so many truly wonderful books written in this form. But these are the ones that stick in my heart the strongest. If you see any on this list that you haven't read, take National Poetry Month as an excuse to add them to your reading list! One of my favorite books of all time. This book is beautifully simple, heartfelt, moving, and a little bit tragic. The sequel to LOVE THAT DOG (and my son's favorite of the two). Every bit as lovely, with a hopefully and heartwarming story about a boy and a cat. Another by Sharon Creech. What can I say? She's a genius! A beautiful story about a girl with Tourette's syndrome trying to adjust to a new school, and the friendship she develops with the boy who lives in her apartment building. A wonderful family/sibling story about a boy who is annoyed that his sister is coming along on the father-son fishing trip. Told in a variety of different poetic forms. Gut-wrenchingly tragic, yet hopeful at the same time. Gorgeous poems throughout. This is the first verse novel I ever read, and I was instantly in love. A bullying story turned on its head! The main character in this story is the bully, and it's fascinating to see what drives him and how he changes. Cool "blackout" poems throughout the book. Family, middle school, sibling rivalry, basketball! Kwame's verse is irresistible throughout this un-put-downable book! Another wonderful sports and family (and school) story told in brilliant verse. Get ready to cry when you read this one. It's the story of a little girl in China, who was abandoned as a baby and is being raised by an elderly American woman. 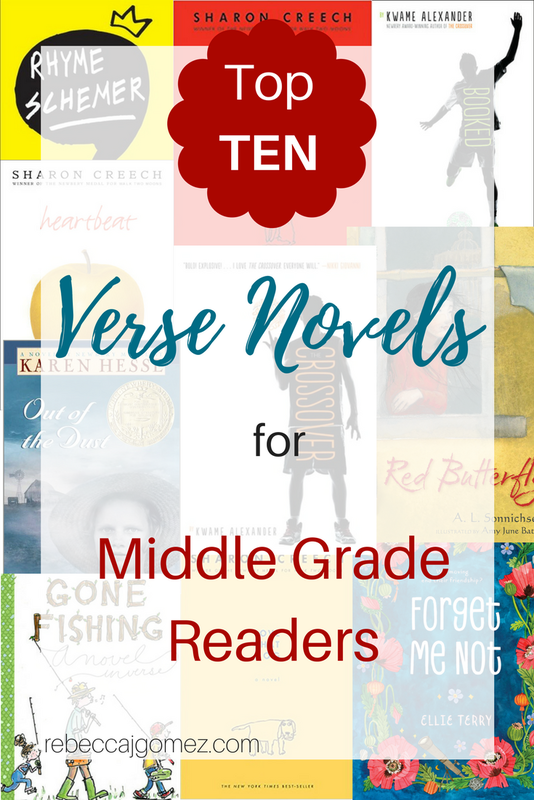 Do you have a favorite verse novel that didn't make my top ten? I'd love to hear about it!